Run command is a very useful and handy for quick launching ofapplication on Windows based systems. However, by default the run command box is missing on Windows 7 Start menu. You can get back run command box on Windows 7 box for that good old way of opening applications quickly using run box. 1. Right Click on Start button & go to properties. 2. Under the start menu tab, go to Customize. 3. Scroll down to Run Command and click on Check box. 4. 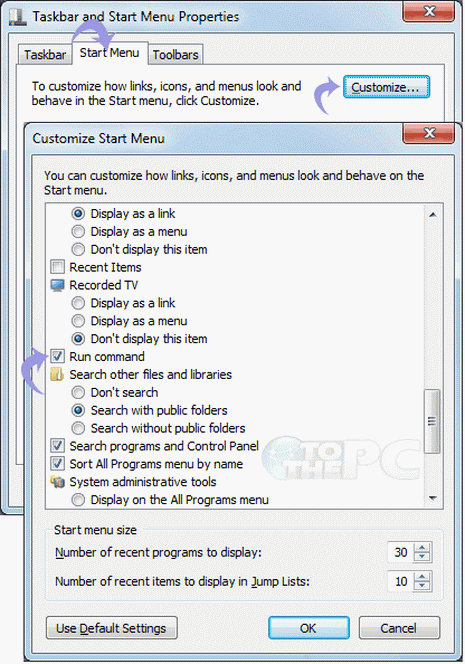 Click OK. Run command box option should start appearing on the Start menu of your Windows 7 computer. Easy, isn’t it? Can I install / upgrade to Window 7 on my computer?